I arrived early and my first task was to orientate myself with the site and facilities. There were two main areas where equipment was being demonstrated, a small area with small diggers, and a lager area with lager trucks and earth movers. I decided to put one of the mannequins in the first area, and the other two in the larger area, where I would stand too. 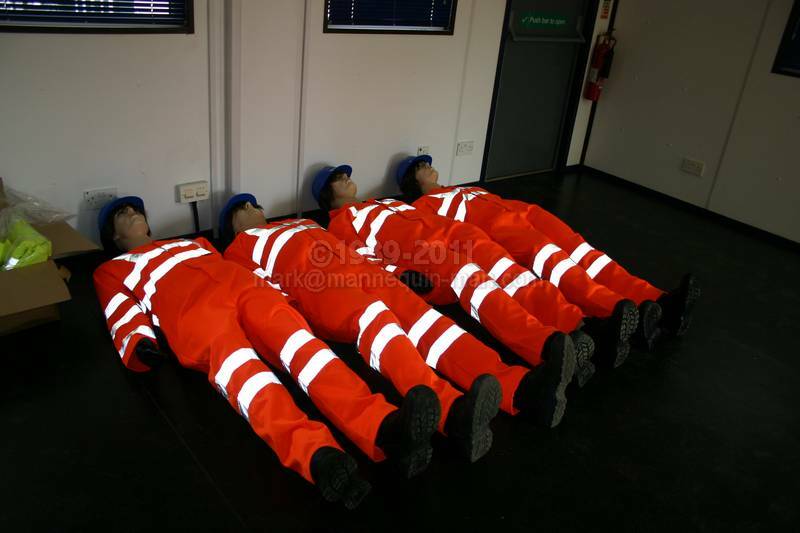 The 3 Camille mannequins were alreday dressed in their orange overalls, gloves and boots, so all I had to do was place the stands into the correct positions, fit them with their wigs and hard hats, and carry them out to their positions. Then to my make-up. I had about an hour left before the start, and the latex make-up normally takes about an hour to do. Given the day was to be hot, I decided to go with the pan stick make-up, even though I'd have to keep touching it up throughout the day, but I knew it would be the cooler option (if you sweat too much under the latex, it starts to degrade and comes away from your face). It's 9:55, and I'm made-up and dressed identically to the Camille mannequins, albeit somewhat broader; then I take my place amongst the displays. I'd chosen to stand by a huge dumper truck (the A40F dumper), as that would be very popular with kids and adults alike, as you could climb up and sit in the cab and pretend you were driving it; and yes they were making the "brum brum" noises, and I'm not just talking about the kids.